Ever since the first portable computer was released there have always been OFFICIAL ways to increase its potential. PCMCIA cards, until recently, have always been the OFFICIAL way to expand laptops capabilities. In old laptops PCMCIA slots were used to increase storage space, memory and add-on what was then considered "futuristic" devices such as network cards and modems. As technology evolved the PCMCIA card slots evolved with it, allowing you to add everything from sound card and serial adapters to more USB ports and FireWire ports. However, we have reached a point in the speed of technology where the transfer speeds and architecture of the PCMCIA slot just aren't enough anymore. The PCMCIA slots are slower than the laptops and cause a "choke point" for newer devices that are all about speed and performance. Enter the Express Card. Express Card Slots. 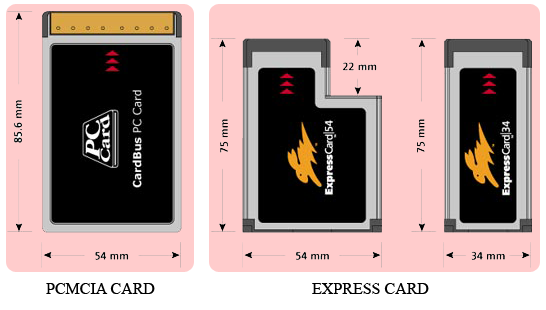 Much like their predecessor, the express card slots are designed to expand the capability of a laptop, with the exception that express card technology is current, meaning it's faster and can handle all the new "toys" that are out there without slowing down the system and creating that "choke point". To the reporting industry, this technology shift literally means NOTHING except yet another device that you have to replace because your old cad doesn't fit in your new computer. Much like the serial and parallel ports, PCMCIA slots have disappeared from most new laptop computers. So why the fuss? PCMCIA slots were the most trusted method of adding serial ports to a laptop that didn't have any. Those serial ports, until the recent introduction of USB devices and writers, drive the court reporting industry as they allow us to connect not only our writers to our computers, but also connect clients to our computers to receive realtime feeds, which make us more money. Express card serial adapters do the same exact thing the PCMCIA card adapters did, they add serial ports to our systems in an official and trusted manor. The only difference is that express cards come in two different types; USB based and PCIe based, with the PCIe based cards being more preferred. PCIe based are hardware based, which are more preferred because they are generally more stable than their USB based counterparts. So, when you purchase an Express Card Serial Adapter for your system, be ABSOLUTLEY CERTAIN that you are buying a PCIe based device and NOT a USB based one. USB based express card serial adapters are subject to the same problems that regular USB to Serial adapters are, which include sporadic failures, freezes and blue screens. Which card type do I need? Express Card or PCMCIA? New laptops do not include PCMCIA ports, but are including a new standard called "Express Card". The following picture shows both types of cards. Note there are two Express Card formats - 54 and 34. An Express Card/34 will fit into an Express Card/54 slot, but not visa versa. Most laptops will also include some sort of blank plastic piece that fits into the Express Card or PCMCIA slot. The plastic piece should roughly match the same and dimensions of the image below.